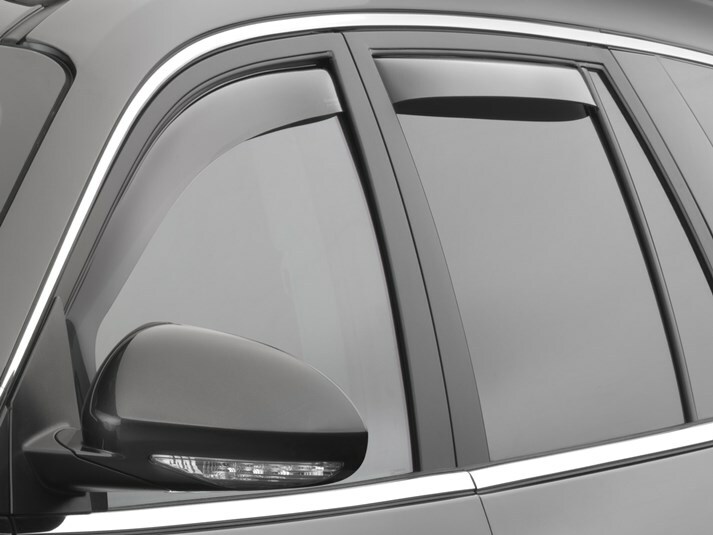 WeatherTech Side Window Deflectors are precision-machined to perfectly fit your 2013 Buick Enclave's window channel. These low profile window deflectors help to reduce wind noise and allow interior heat to escape. Our light tinted Side Window Deflectors are the only deflectors in the world made with a D.O.T. (U.S. Department of Transportation) approved glazing material. Available in light and dark tint for most vehicles. Designed and Engineered in USA – Handcrafted in Germany. I absolutely love and recommend the window deflectors for any vehicle owner. I owned front and rear sets for my last vehicle (2005 Toyota 4Runner) and I waited in anticipation for them to manufacturer them for my new Buick Enclave. They are truly a convenience especially during a rain storm when you need to open you window for a toll booth, drive thru etc. My inside door controls would become saturated within a few minutes. No longer-- these work great and I think they add a sporty but classy look to my car. Not to mention you do not need to deal with 2 way stick on tape-- installation was a mere 2 minute breeze. Kudos to the person who developed the inchannel design-- I will never be without the WeatherTech side deflectors for any vehicle in my future.